It’s strange how so few of us understand the fragility of life, even though we all know that as we walk out our journey here, no one escapes death. It’s that much harder to understand the loss of a child, though, and even more painful when a tragedy like this happens at Christmastime. Wesley Mac Burnham was an amazing son; he was a brother to nine-year-old Jacob and seven-year-old Noah; he was a cousin, a grandson, and a friend. 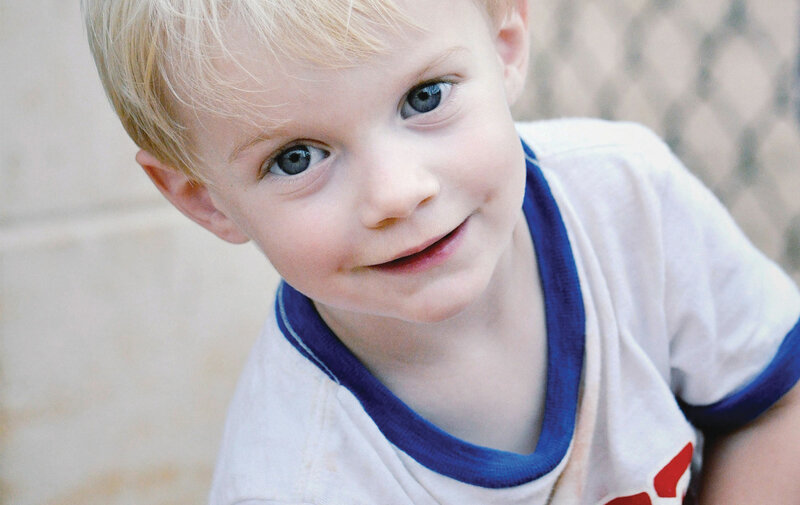 This precious two-and-a-half-year-old blond-haired angel was the proud son of Jeff and Jill Burnham until he made his journey home to heaven on Friday, December 19, 2014. The strength, dignity, courage, and grace that Wesley’s parents and loved ones have shown to the world since the fateful accident that took him home has been otherworldly. How they’ve managed to endure their loss and grief is a testament to their character and their trust in God. Two weeks before Wesley passed, we were driving home from school and talking about his day. As I went to turn onto Thomas Drive, he said to me, “Mommy, I’m getting an electric guitar.” It wasn’t a shock because it’s all he has talked about for the last three months, but for some reason that day it was different—he had certainty in his voice. When he said he was getting a guitar, I asked, “How do you know that? Do you think Santa is bringing one?” He replied, “They are making it for me—I can see it.” I remember it taking me back for a second, and I wondered: “Who does he think is making it and how do I answer this one?” You see, Wesley knew about the magic of Santa, but was too young to understand the idea of elves and Santa’s workshop. When he spoke, he made no reference to Santa, but just said they are making it. Then he got very quiet and softly said, “Do you want to see it, Mommy?” I asked how I would and he replied, “Because they are making it for me and I can see it.” I will never know for sure, but I believe that he was not talking about a gift from Santa, but a gift from God made by angels just for him. I had major surgery on December 5 that required me to recover at home in bed for a few weeks. Wesley’s Gigi, Peggy Burnham, lives close by, so she offered to help us by driving him to school every day so that Jeff could take his older brothers to their school. They received the list of songs he was to learn for his Christmas program and practiced every morning. The day of the program he was ready! During his celebration of life service, Gigi spoke about how she was uncertain of her speech the night before, but when she got into bed, she had a vision. She said she couldn’t help but wonder if Wesley’s Christmas program wasn’t the real program he was preparing for, but maybe a casting call for leading the band for Jesus’s birthday celebration. Wesley’s last day on earth, he spent the morning in his classroom preparing for the program. His teacher, Deanna, said it was almost like it was his day. As they had circle time and rehearsed one last time, he got in the middle with his guitar and his friends held hands and sang around him. During the program, he got his own microphone and proudly played his guitar and sang next to his idol, Mr. Bill. But as excited as he was, he was different that day. He was very calm and quiet and clingy, yet distant at the same time. It wasn’t unusual for Wesley to run after his Daddy when he left the house, but he had never gone past the door. I will never understand what was different about that night and why for the first time he ran not only to the gate but also through it. He had sixty seconds to run from inside the house to the road from the time the gate opened to the time it closed. I have to believe that maybe he was seeing angels and went to them. We may never have the answers as to why, but we do know Wesley is pure again. He will no longer suffer from the burden of celiac disease; his body has been restored, and he is in Heaven with a sibling he had never gotten to meet. We have an angel watching over us, and although we’d give anything to have him here on earth, we know he was loved and will always be missed. Wesley’s parents have set up a foundation to honor their son’s love for music, his love for God, and his love of people. The mission is to provide scholarships for families who need financial assistance, to help fund music programs, and much more. Woodlawn Child Development Center at Woodlawn United Methodist Church, where Wesley attended school, is a very loving, safe environment that nurtured his love of God and music. They are currently limited in space and are in need of an addition to their building. They have a waiting list of two years, so while scholarships will help people immediately, they can’t reach full potential until there is more space to grow. The immediate goals are to provide scholarships and to help fund a new preschool building. Once those goals are accomplished, they hope to reach out beyond the Woodlawn family and help others in the community. They currently have a Facebook page at facebook.com/wesleyburnhamfoundation, and the BurnhamFoundation.org website is coming soon. The Wesley Mac Burnham Foundation, Inc. has made application for tax exemption status under section 501(c)(3) of the IRS code; that application is pending at this time. Contributors/donors to the Wesley Mac Burnham Foundation, Inc. do not have advance assurance of deductibility for contributions to the organization while the organization’s application is pending. If the organization ultimately qualifies for exemption for the period in which the contribution is made, the contribution will be tax-deductible by the contributor/donor. Alternatively, if the organization ultimately does not qualify for exemption, then the contribution will not be tax-deductible by the contributor/donor.